This book has information and activities to introduce your child to 50+ careers. Instead of allowance, kids earn paychecks for trying out real careers. See my review of the book here. www.raisingceokids.com has many resources, one of which is interviews with successful kid & teen entrepreneurs. You can learn what type of businesses they have created and how successful they have been. Dr. Jerry and Sarah Cook have also written a new book, The Parent’s Guide to Raising CEO Kids, that is on sale now. If your child becomes interested in starting his/her own business, Biz at Bedtime is a fabulous place to start. Biz at Bedtime is a child-friendly, one page business planning tool. 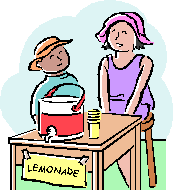 It leads your child through business plan basics, such as 1)product; 2) price; 3) customers; and 4) mission statement. And, of course, once your child creates a business and starts making money, you want to teach them great money management skills. We (www.moneytrail.net) can help with that! Kids learn to keep track of their own saving and spending. Are your children young entrepreneurs? What tools have helped them along the way? Please share your story in the comments below.